You know what they say, many hands make light work. That’s the case here around the country. We have a great team of dedicated Gooners who work incredibly hard behind the scenes, for one reason only……for the Arsenal! Meet the team…. 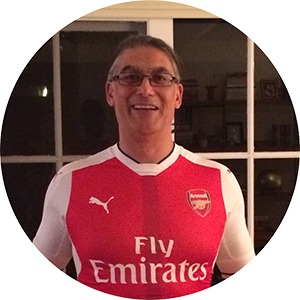 Tony was born in Hammersmith and has supported Arsenal since 1970 when he heard about the Fairs Cup win on the radio whilst living in Singapore. He arrived in Australia in April ’89 and narrowly missed the famous Title win a few weeks later after waiting so long to see the gunners win it again after ’71! To this day he still enjoys baiting his Father and youngest Brother from afar who are both Spuds! !Tony joined the Supporters Club back in 2007 at its inception and assisted in gaining the numbers of Members required to form the Club. As an original founding Member he was responsible for developing the Victorian group of supporters using Melbourne as a base. Quickly the group became the largest State group as they enjoyed wonderful support of an Irish bar, The Celtic Club, who had an affinity for the famous Irish players who had played for the Arsenal, in particular, Liam Brady. Over the years the bar has dedicated the entire 2 storey venue to Arsenal big matches and events. To date they have hosted 2 Arsenal Australia Supporters Club National Meets. 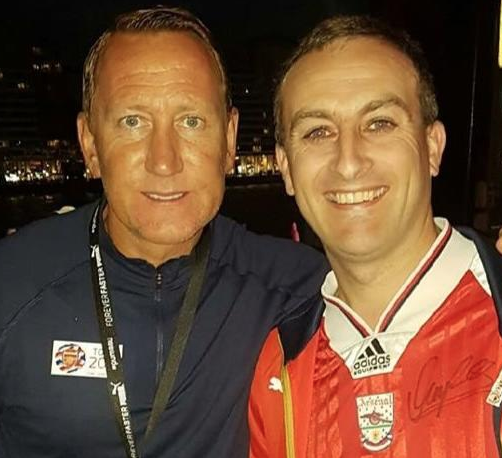 Last season Tony took on the role of Chairman and is proud to lead a passionate and committed Supporters Club who are striving to be the best in the world. 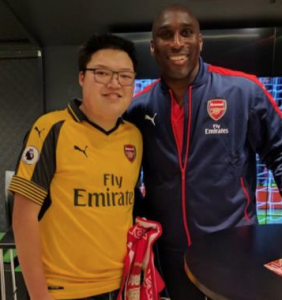 He regards the Arsenal FC Tour of Singapore when he travelled with 60 fellow Members of the Supporters Club as a treasured memory and is looking forward to July 2017 when we will have the pleasure of hosting Arsenal here in Australia. Growing up in the western suburbs of London I was lucky to see Arsenal quite a bit home & away. My 1st memory of Arsenal is watching the 1971 FA Cup final on TV as a 7 year and my 1st visit to Highbury was for the FA Cup 4th round win against Notts County in 1979. I was lucky enough to get to visit Highbury & The Emirates Stadium on many occasion before I moved to Perth in 2008 and have happy memories from both including “The Invincible’s” season in 2003/04 and the final season at Highbury in 2005/06. I was at The Emirates for Dennis Bergkamp’s testimonial & Arsenal’s 1st game at The Emirates in July 2006 and managed to get to most home games (and a few away) in the two years before my move to Australia. 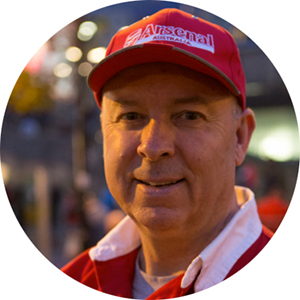 Warren is the Secretary of the “Arsenal Australia Supporters Club” and has been an avid Aussie Gooner since 1971. It started when watching the telecast of the Arsenal v Liverpool FA Cup Final and seeing his namesake “Pat Rice” play Right Back in the 2-1 victory.In April 2008, he visited Arsenal to organise the Club component of the annual AASC Members Tour Package and while there watched Arsenal defeat Everton 1-0 in the last home game of the 2007-2008 Season. 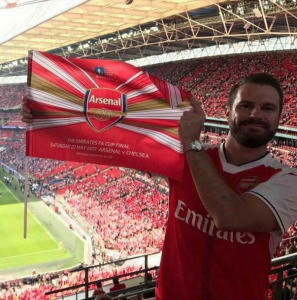 Since 2010 he has organised and taken groups of Arsenal Australia Supporters Club members to London to cheer on the Gunners for themselves :-)Warren is also the Armidale, NSW Rep.
Graham has followed the Arsenal since he was a young lad in the late 70s. Most of the family are Gooners too including his wife (whose parents had a pub off Holloway Road), both sons, in-laws, uncles etc. 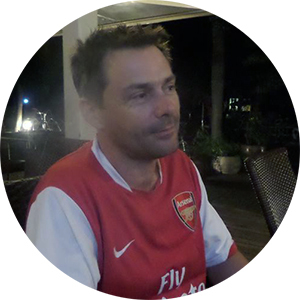 He founded ozarsenal.com, ran the Australian Internet Supporters Group for 10 years and has also organised FA Cup and Champions League nights over the years. He was one of the Official Supporters Club founders, was Chairman from 2007-2015 and has been Treasurer since then. He has been on many committees and boards of various community and sporting groups as well as businesses. 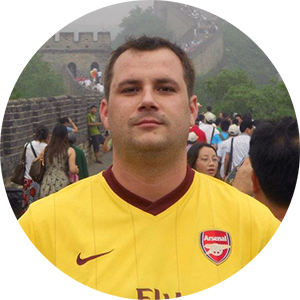 Born and raised in West Sussex, UK, Matt has been a supporting AFC since 1996, where he fell in love with the likes on Dennis Bergkamp and Ian Wright, but Matt’s relationship with the Gunners went into overdrive in 2001, when he was selected to be a ballboy at Highbury for the double winning 2001/02 season.Matt moved to Adelaide in 2012 and discovered the Arsenal Australia supporters group and took charge of the Adelaide group from Carlin Garrett, who moved to London. Since then, the Adelaide Gooners have experienced 2 unforgettable FA Cup Final nights at the Arkaba Hotel. Matt has a tight group of passionate committee members in Adelaide to help run the group along with a fantastic relationship with a local sports store for membership benefits. Originally from Stevenage in England, I came over to Australia in 2008 for a year out. Turned up at Arsenal Australia AGM in Adelaide with backpack and suitcase, but decided to make Brisbane home after I met my 2nd love (after Arsenal). I come from a family of Gooners, so luckily had no choice in being a Gooner! Dad took me to my home debut at Highbury in 1984 vs Coventry as a 7 year old. It was a boring draw, but I was in awe of the stadium and atmosphere, and although I was scared being so high up back of Highbury’s East Stand, I was hooked.I’ve been season ticket holder from age 13 in West Stand where I sat for 10 years, but definitely consider myself a Clock Ender where I stayed, until I had 1 season at The Emirates. I still hold a season ticket, in hope that I will take it back over one day. I’ve been lucky enough to follow Arsenal both Home and Away and across Europe for many years, mostly during George Graham’s and Arsene Wenger’s successful days. Particularly memorable overseas trips include Parma, Copenhagen, Paris and Madrid. I only missed a couple of games home and away during Invincible’s season, but stupidly one of them was the Spuds game, as I was in Egypt for my parents’ Anniversary. It gets busy at times, but I do really enjoy my role in Ticketing, helping Aussie Gooners to get tickets to Arsenal games at the Emirates. I am an avid Arsenal fan of 10+ years. Arsene Wenger has been the only manager i’ve known at Arsenal so I’m excited to see what Unai will bring to the table. My greatest Arsenal moments are: seeing Arsenal play live vs Stoke winning 3-1 in December 2016 (the last time we were top of the league) and watching my 2 beloved football teams play each other – Sydney FC vs Arsenal FC, in a Pre-season friendly 2017. Sports fan by night and recruiter by day, Outside of Sydney FC and Arsenal FC, I also follow: Sydney Swans (AFL), Wests Tigers (Rugby League) and the Seattle Seahawks (NFL). I was born in Surrey, south of England to an English Father and French Mother, and emigrated to Perth when I was just two years old. My Father was never into football, so it was when I was 8 years old and playing football with some older boys who were neighbours in my street in Woodvale, where I became a Gooner. Brothers Ian & Simon Woolley were both older than me and handed me down their old Arsenal shirts which they had outgrown. Although keen on football, it wasn’t until the age of 13 whilst watching the 1998 World Cup in France, that I really fell in love with the beautiful world game. 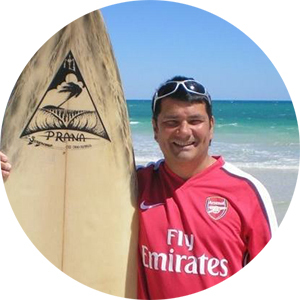 I joined Arsenal Australia in 2014 & have worked with senior Members in organising events in Perth. In September 2017, I took on a lead role in establishing the Inglewood Hotel in Mt Lawley as the AASC Perth Gooners Supporters venue to watch Arsenal games & created all match-day events. I was honoured when asked by outgoing State Rep, Kevin Sanders, to take over his role. I, known as Phil/Chappas to most Perth Gooners, am looking forward to working with the Arsenal Australia leadership team. COYG! Michael has been a member of Arsenal Australia since 2008 and in that time has helped grow the supporters club in Brisbane, Queensland and then moved on to run our ticketing department. All it took for Michael to fall in love with The Arsenal was a 10 minute spell watching the legend himself Dennis Bergkamp through a highlight package on a late night SBS show back in the 90’s and since that time he was hooked on such a great club and year after year that passion for the clubs grows even more. 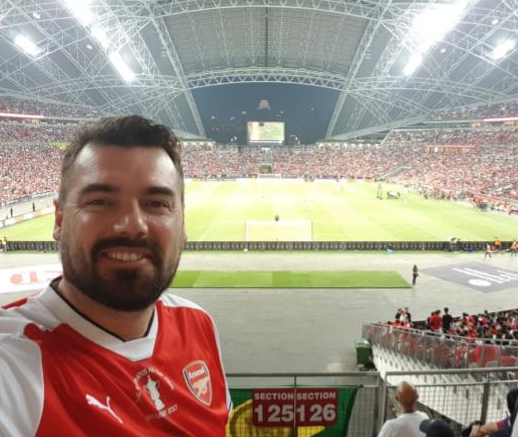 Michael has seen The Arsenal play on numerous occasions on a few different continents and can’t wait to watch his club in his home country next year! I have been a Gooner since the first Arsenal match I watched, the 2002 FA Cup Final. I was hugely impressed with the ‘Its Only Ray Parlour’s goal, but when Freddie Ljungberg’s screamer hit the back of the net I was hooked for life. I’ve since been over to watch many games at Highbury, the Emirates and even had the pleasure of being behind the goals when Aaron Ramsey headed home the winner in the 2017 FA Cup final. I’ve been an active Member of this fantastic organisation, the Arsenal Australia Supporters Club, since 2008 where I’ve been involved in many annual National Meets as well as regularly attending local get togethers and as a Member have made life-long friends here in Melbourne and around the country. 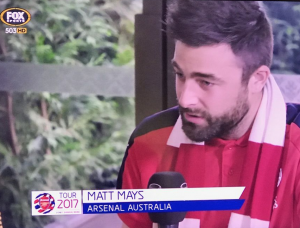 As the Club has grown over the year I have also enjoyed the experience of travelling with Gooners from all over Australia on overseas Tours organised by the Club to London as well as the recent Pre-season Tour in Singapore. My name is Fabio and I am a passionate Arsenal fan since the early 2000’s after watching Dennis Bergkamp’s wonder goal against Newcastle. After that I was hooked and could not get enough of the Arsenal and been following ever since. Finally after hundreds of late nights/early morning matches on the TV. In 2016, I fulfilled my lifelong dream of going to the Emirates to see my Arsenal North Bank Terrace stone and watch my first ever Arsenal game! It was against Chelsea and we took it to the blues and won 3 nil! In 2017, got to see the Arsenal on our home soil where Arsenal Australia Supporters Club held some amazing events. It was then being a long time member I decided with fellow Gooner Sean to spearhead the Darwin and Northern Territory branch. 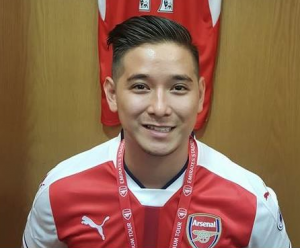 Now part of the Arsenal Australia team, I’m looking forward to growing the Darwin and NT branch and making more memories with the Arsenal family… COYG!